In Wisconsin, K-8 teachers are not required to take a physical science laboratory course for certification, yet most teach physical science at some level to their students. The goal of this project is to produce a next generation of K-8 educators who are knowledgeable and enthusiastic about teaching math and science. Our semester-long courses in physical geology and educational science methods have been combined into a year-long course, co-taught by Geology and Education faculty, integrating the learning of earth-science content with the methodology of how to teach it. Beyond contributing to the future teacher workforce in the region, the project is disseminating the model of a collaborative, integrated science/education course to a national audience through these web resources and a workshop in April, 2016. 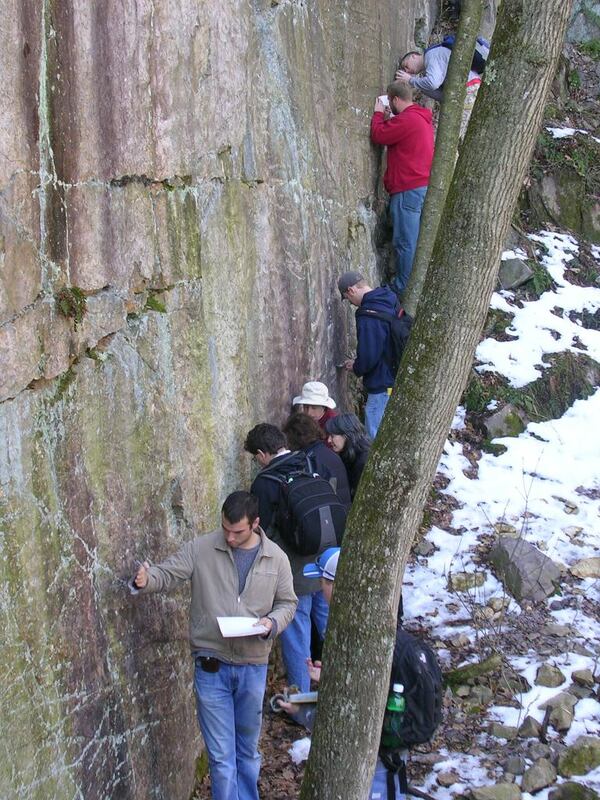 University of Wisconsin-Madison students at an outcrop during a field trip to Baraboo, WI. Explore the curricular materials developed by this project, including the course syllabi. Explore a set of K-8 geoscience lesson plans developed by students in the Integrated Science Methods and Introductory Geology course at St. Norbert College. Combining the learning of science content with learning about science pedagogy is a powerful way to prepare pre-service teachers for their teaching careers. A two day workshop, designed to share materials and lessons learned from our teacher preparation program, will be held at St. Norbert College on April 8-9, 2016. NSF funding will cover the costs of the workshop for participants, including housing and meals. Go to the workshop website for more information and the application form. This work is supported by the National Science Foundation (NSF) Division of Undergraduate Education under grant #1141208 .